Breanna Stewart shoots over the Sun’s Camille Little. Photo by Neil Enns/Storm Photos. 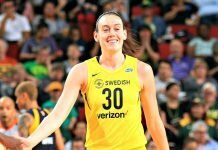 Seattle, Wash. – Through her first 13 WNBA starts, Breanna Stewart hadn’t made more than three 3-pointers in a game, and had just 10 for the year. The 21-year old was shooting just 21 percent from behind the arc, well below her college averages. On Friday night against Connecticut, she hit one 20 seconds in. Then three more, all without a miss. It was that kind of night for both the UConn product and her team, as the Storm rode a piping-hot first-half shooting performance to a 98-81 victory over the Sun at KeyArena. The Storm (5-9) scored the game’s first 10 points, and 17 of the first 19 to take a lead that would remain double digits for the rest of the night. Seattle shot 77 percent in the first quarter, and 70 percent for the half, to lead by as many as 23 before taking a 19-point lead into the break. 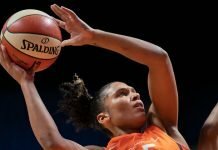 Connecticut (3-11) was able to whittle the deficit down to 11 in the final minutes of the third quarter, with the Storm halting the Sun run and stretching the advantage out to a game-high 24 with four minutes to play. 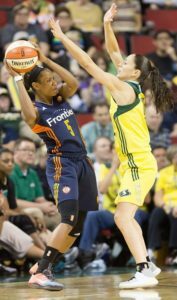 Sue Bird applies tough defensive pressure to the Sun’s Jasmine Thomas. Photo by Neil Enns/Storm Photos. Stewart finished the night with a season/career-high 29 points (and a game-high nine rebounds), as one of four Storm players in double-figures. 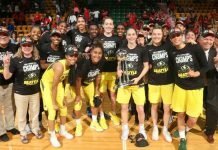 Sue Bird and Jewell Loyd both had 19 points, while Crystal Langhorne had 15. The Storm ended the game shooting just over 60 percent from the field, their best performance of the year, while notching a season-high 98 points. That wasn’t a bad result for a team that focused solely on defense in practice throughout the week. 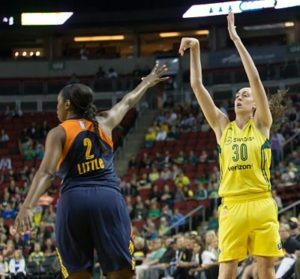 Meanwhile, Seattle held Connecticut to just 38 percent shooting on the night, their worst night from the field since a streak of cold shooting to start the season, one that saw the Sun shoot under 40 percent in three of its first four games. But while Boucek was impressed with her team’s scoring punch, she specifically mentioned rebounding as an element that needs more work. Seattle allowed 20 second chance points on the night, and was out-rebounded 34-to-29 (15-to-2 on the offensive glass). Seattle is back at Key Arena on Tuesday night at 7 p.m. to take on the Atlanta Dream. 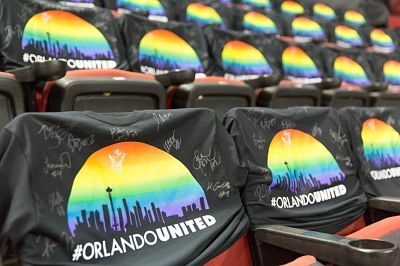 Forty-nine #OrlandoUnited shirts, each signed by the entire Storm team, were placed on seats to remember those lost in the Pulse tragedy. The shirts were sold to raise money for the One Orlando Fund. Photo by Neil Enns/Storm Photos. Friday was “Pride Tipoff” Night at Key Arena, with the team selling #OrlandoUnited t-shirts to benefit the OneOrlando Fund. All 500 shirts — offered for a $10 minimum donation — were sold, along with 49 shirts autographed by the entire team, which sold for $100 each. 56 first-half points was the most Seattle has scored in the first 20 minutes this season. It was an amazing game to see! I was really hoping that the Storm would come out on fire and bury this team and that’s what happened! I was thrilled, especially for Stewie!! Shades of Lauren Jackson tonight! I’m not happy about their continued lack of rebounding, especially on the offensive glass, but loved the win! Thanks, Joe, for the nice recap.